This is the cutest Gingerbread house! Out front are seven Gingerbread kids playing on sleds and waiving from the balcony. The house is surrounded by green gumdrop pine trees with white snowballs. 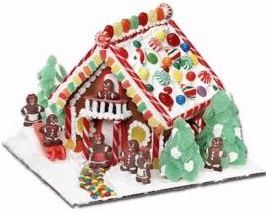 The house roof is colorfully decorated with a variety of flavorful candies and treats. Even the walkway up to the house is a sweet welcoming one and the balcony above is a statement piece of architecture for these Gingerbread kids. The Best of Times will be had for sure with this amazing Gingerbread House creation! Visit here for details.